*squees with delight" My Sc-fi geeky self and my equally geeky spawn, are off to see this come May 1st. I grew up a DC comics kid but soon marveled at the characters in Marvel. Marvelous ending (did you see what I did there?) to your Disney A-Z posts. I have really enjoyed what I have seen from your blog, another excellent post. who is this Ultron thou speaketh of? Let him show his face! Saw this on Saturday and really enjoyed it. Not as much as Avengers and the rest of Phase 2, but still, a lot ;) Thanks for a great month - I have really enjoyed all your posts. So excited to see this! It's been great getting to know you and your blog! Congrats on crossing the A to Z finish line! My son loves the Avengers movie. I'm very excited to see that Joss Whedon wrote and produced this film...will make watching with him more enjoyable. CONGRATULATIONS on a job VERY WELL DONE, Sir! As much as I envy his hair, I haven't seen the movie. Congratulations, Jeremy! High-fives all around and something strong in a very tall glass. You were a most awesome contributor to the alpha-madness. Martha is grateful, and I am too. I don't think I ever say the Avengers. Sacrilege, I know. I CAN'T WAIT FOR AVENGERS!!! 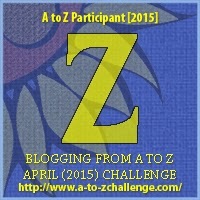 Congrats on making it to the end of the A to Z Challenge! Thanks for being such a super host Jeremy, your motivation kept so many of us trekking out the posts... I'm looking forward to seeing Ultron. In the comics hes a wicked character with extraordinary capabilities. Great movie shots! I probably won't see it this weekend but early next week. Very excited about. I really enjoyed your challenge theme. We will go see that. Not sure when yet. Kiddo wanted opening day, but she has to work. But, we will get there. That is quite a collection of Zany characters! Yay for Z. And Yay for crossing the finish line. yup, definitely been anticipating this and seeing so many people talking about it! I hear this movie is supposed to be GREAT! I can't wait to see it! Congrats! We made it and what a great ending! We're going to see Avengers this weekend and I'm SOOO excited. It's already made over 250 million overseas. This will be huge. Thanks for being such a cool co-host. As for my own reward for finishing year2, I'm asking the hubster for a steak dinner tonight :) Later! I can hardly wait for this weekend! Love the Avengers. I know Alex is enthusiastic about this film. Didn't see the first one, maybe I will get round to doing so soon. Thanks for your blogs this month Jeremy. Certainly enjoyed them. I'm super excited for this superhero movie! I've enjoyed reliving all the fun Disney movies in your A to Z theme. Congrats on finishing the challenge! It's an epic win Jeremy! This movie is still on my to-watch list, and now that the challenge is over, maybe I'll actually have the time to sit down and watch it. Thanks for co-hosting the challenge--that's a bit commitment to take on--and thanks for your entertaining posts. Catch you in May! Looks like a great movie. Congrats on making it to the finish line. I saw the movie today. Totally fangirling over it.